That’s after Ben Thompson’s January departure, with the Blues boss unable to find a settled engine-room partnership that he sees fit for the job. Indeed, since the 23-year-old was recalled by parent club Millwall, Pompey have, it’s fair to say, struggled to fully recover. Thompson formed a smooth defensive-midfield alliance with Tom Naylor, helping the Blues to top the division for almost four months in the process. But three League One defeats and a draw in the wake of Thompson’s absence, plus a new position of third in the table, underlines how much the Lions player has been missed. And to make matters worse, Pompey will be without his former partner-in-crime, Naylor, when they travel to Plymouth on Saturday. The former Burton Albion ace starts the first of a two-match ban, after accumulating 10 league bookings. What’s more, January recruit Andy Cannon remains sidelined with a quad injury. Meanwhile, Dion Donohue is also a serious doubt after picking up a shin cut in the 1-1 draw against Doncaster last weekend. So, approaching a game of this magnitude, Jackett will be forced to rejig his engine room once more. That will be music to the ears of Derek Adams, as he prepares his side for a fixture that has brought with it an intense rivalry in recent seasons. So what are Jackett’s options ahead of the trip to Home Park? Well, it looks like Ben Close is set to remain in the Pompey line-up. The academy graduate has started the past two games against Doncaster and QPR and, crucially, has minutes under his belt. Now the manager has to weigh up if he wants another ball-playing midfielder alongside Close, or someone who can imitate Naylor’s screening role. If the Blues boss opts for the former, Bryn Morris and Adam May will fight it out for the berth in the 4-2-3-1 formation. Naturally, you’d expect Morris to be given the nod. A former England youth captain with plenty of League One experience under his belt – he ticks the right boxes. However, it was May who started in the FA Cup replay loss at the R’s on Tuesday night, with Morris still recovering from an ankle injury. The former struggled to impose himself at Loftus Road, and was substituted just before the hour mark by the January arrival. With that in mind, it could all depend on how Morris’ ankle has reacted to those 30 minutes in west London. But if Jackett instead wants a Naylor-type enforcer to shield the back four, then Anton Walkes should be the go-to man. The former Spurs man has primarily operated as a right-back this campaign – when he’s managed to get into the team. Walkes is blessed with versatility, though. While on loan at Fratton Park last season, his two best performances – in wins over Walsall and Wigan arguably – came when he was policing the midfield. 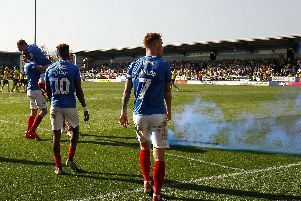 It may be what’s required against a rejuvenated Plymouth side, who always seem to have a grudge to bear when Pompey are lined up against them. But only Jackett really knows how best to approach a game that possess a serious threat to their automatic promotion ambitions. So what will it be, boss, a ball player or enforcer?